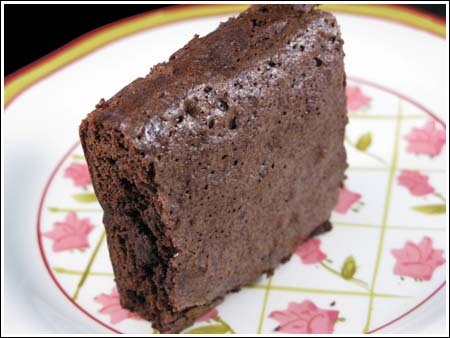 This Zingerman’s Magic Brownies clone recipe was recommended to me (over and over and over again) by Randi. Randi put dulce de leche in them and called them Buenos Aires brownies, but I prefer leaving them as is. What’s great about this recipe and why I put it under the Top 5 “Bake Sale” recipes is the brownies are fairly sturdy and you can wrap them individually. Preheat oven to 325 degrees F. Line a 13×9 inch metal pan with nonstick foil. In a heavy small saucepan, heat the butter over medium heat. When halfway melted, reduce heat to low and add chocolate; stir until melted and smooth. Set aside. Sift together flour, baking powder and salt onto a sheet of paper or into a bowl. Beat eggs and sugar with an electric mixer on high speed for 5 minutes or until light yellow and fluffy, scraping side of the bowl occasionally. Add slightly cooled (it will still be a little warm) chocolate mixture and vanilla to egg mixture. Beat on low speed or by hand until combined. Add flour mixture; beat on low speed or stir by hand until combined, scraping sides of bowl. Stir in nuts (if using) or chocolate chips. Spread batter in pan. Bake 30 minutes or until brownies appear set. Cool in pan on wire rack; cut into bars. To freeze, let cool completely, wrap tightly in foil without cutting. Freeze until needed. I usually make these sifted cake flour.1 1/2 cups sifted cake flour weighs about 5.3 oz. Unsifted weighs 6 oz. I used to use 6 oz unsifted, but I now use sifted so the weight is 5.3 oz. If using all-purpose flour, your best bet is to weigh out 5.3 ounces or stir the flour well and measure 1 1/4 cups. I grew up in Ann Arbor and used to live for Zingermann’s baked goods (it helped that my aunt is a baker for them, so we always got great discounts). By far, my number one choice was always their magic brownies. Now that I live far away, I never get to enjoy them anymore. I guess I’ll have to make these and see how they compare. Oh, dulce de leche. I brought a lot back from Buenos Aires last time I went and made some amazing brownies. I didn’t quite get the swirl I was aiming for, but the result was even better: the dulce molecules seemed to bond to the chocolate molecules and the whole thing was incredibly moist and rich and amazing. VG, happy belated Earth Day to you! Sarah, I just scanned your post and will read it again more thoroughly, but I did see that you were not thrilled with Ina’s “Outrageous” brownies. Interesting. I used to love that recipe, but kind tired of it. Then I realized that the brownies didn’t hold up well in the heat and seemed to need more refrigeration. So I moved away from the Outrageous recipe. I did like them quite a bit, though. Anonymous, thanks for those CL recipes! The sour cream coffee cake muffins looked particularly good. Kalyn, that peace pledge seems like a nice thing for elementary school kids to hear every morning. I actually like having a Texas pledge, but it’s sort of redundant in that it just mirrors the regular USA pledge. Your tilapia looks good btw. Makes me wish I liked fish. I will build peace at school, at home, and in my community each day. I think it’s actually pretty effective at reminding them about those things. I bought a jar of the dulce. Our store brand(Presidents Choice) is really excellent and its from Argentina. The best part is its only 2.99 a jar. If you were to use dulce de leche to swirl in, do you just buy a jar of it, or, where do you get this or make this? I can be very persistant eh? I really, really hope you like them since I’ve talked them up so much. I used callebaut when I made them the first time, but at work I used baker’s unsweetened. People still loved them. Those brownies look quite decadent – yum! !